This weekend, we picked up our final share of the Winter CSA. The larder is definitely overflowing. We still have some vegetables stashed from last month. 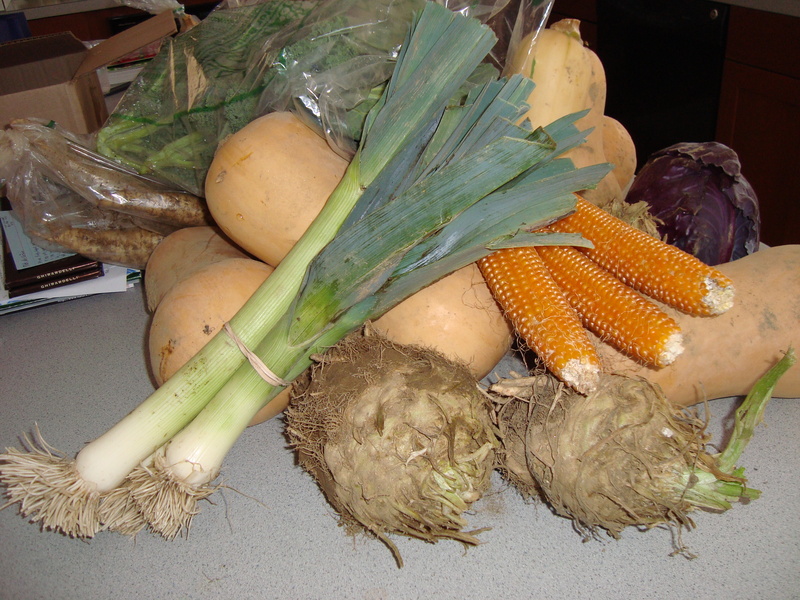 This time we got cabbage (green and red), leeks, butternut squash, celery root, kale, collard greens, onions, potatoes (regular and sweet), turnips, beets, carrots, parsnips, lettuce, and popcorn. We had our annual latke dinner this weekend. It’s one of the least healthy meals of the year — all that oil. We make a double batch of latkes, and the two of us eat them all for dinner. Usually, that’s the meal, but this year we had a small salad to help the digestion. I can never keep track of the recipe from last year. This year, we tried a new recipe from last week’s Boston Globe. It was a winner, so I’ll try to keep track of it for next year. Another winner with Sunday’s dinner — Roasted Winter Vegetables. I cut up a variety of vegetables from our CSA stores and roasted them with oil and herbes de Provence. The veggies are sweet and tender. Lots more vegetables where those came from so we’ll be making this again. Preheat oven to 450F. 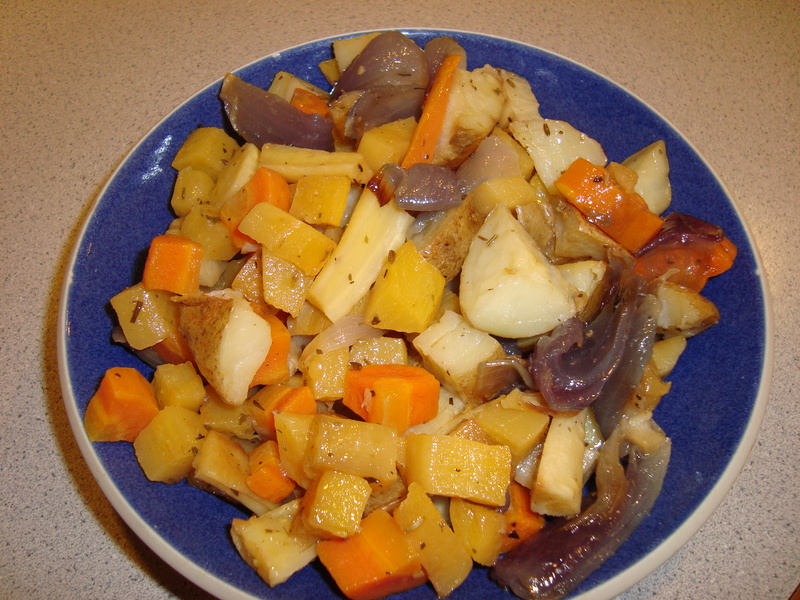 Cut potatoes, carrots, parsnips, and rutabaga into 3/4 to 1-inch pieces. In a large bowl, toss root vegetables, onion, oil and herbs until well coated. Spread the vegetables in one layer on a large baking sheet. Use more than one baking sheet if you need to. Cover pan with foil. Bake for 20 minutes. Remove foil, toss, and bake uncovered for 20 more minutes, stirring halfway through. Roast for a total of 40 minutes, or until the vegetables are tender. Posted on 14 December 2009, in Winter CSA and tagged latkes, root vegetables. Bookmark the permalink. 3 Comments. Your roasted vegetables look great! Our farm had that celery root too, and I have to say it presented a challenge. If you find a way to use it – please share! Thanks for letting me read your blog even though “I don’t cook”. Should I sign this “your other friend named Lauren”? You’re funny. I just didn’t think you’d want to read my blog because you don’t like to cook. I’m glad you are enjoying it. And, I’m glad I was inspiring.